Côtes de Bordeaux is a collection of five regions in the Bordeaux area of France. Four regions formed a union in 2009: Côtes de Blaye, Côtes de Castillon, Côtes de Francs and Côtes de Cadillac. Two years ago a fifth region joined: Sainte-Foy Bordeaux. The regions in Côtes de Bordeaux are not contiguous. They do cluster around the rivers that run through Bordeaux. The vineyards are mostly planted in clay-limestone soils. The regions in Côtes de Bordeaux have about thirty thousand acres under vine. (Napa Valley has about forty-five thousand acres). These thirty thousand acres represent about ten percent of the total in Bordeaux. 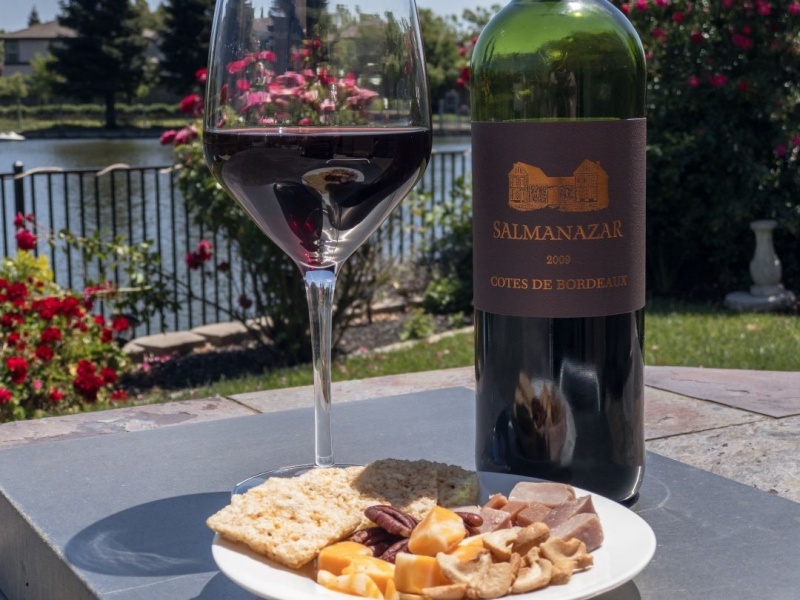 The red wines from Côtes de Bordeaux are blends with Merlot as the primary variety, with the addition of Cabernet Sauvignon, Malbec, and Cabernet Franc. What makes it worth looking for wines from Côtes de Bordeaux is that these regions are not as well-known as, for example, Saint-Émilion; which borders Côtes de Castillon. This lack of fame is reflected in prices that are more affordable. The wine that I tasted for this article had a rather uninformative label. It stated the origin, the vintage, and the name of the wine: Salmanazar. Usually, wines from Côtes de Bordeaux also tell you from which of the five regions the wine was sourced, but not in this case. The wine’s name is also a little confusing. Salmanazar is one of the biblical names given to large wine bottles; Jeroboam and Rehoboam being another two. A Salmanazar is a nine-litre bottle, holding as much wine as a full case of regular bottles. This 2009 Salmanazar cost $13. The nose was an appealing first impression with blackberry leading the way backed up with aromas of a damp creek and drying flower petals. The first sip was not as rich with fruit as the nose had suggested; earth and dusty tannins dominated, with muted fruits very much in the background. The finish is fairly light. If a Napa Cab is the taste of ripe summer fruits, this wine is the last taste of summer as the year fades to a dry and mellow autumn. Overall, I quite liked the wine and it tastes better than the $13 price point would suggest. We paired the wine with two different dishes, a simple cheese plate with some chunks of smoked ham and crackers and Hanger steak with fries. Whilst the wine was ok with the cheese, it really came into life with the barbecued hangar steak. The wine added a smokiness to the flavor of the meat making it feel far more luxurious in the mouth. If you are going to pair this with cheese, we found that it really needs a strong cheddar to stand up to it. Here is a list of our group #Wineophiles and what they have had to say about their experience with Côte de Bordeaux. All of the posts will be live on Saturday, May 19. I paired one of my wines with BBQ beef sandwiches and, I think, that might have been my favorite match! Thanks for joining us. The day after I made the meal, I had leftover wine and meat so I too made bbq beef sandwiches. I agree it was a great combo! Thank you for commenting. I really enjoy this group. So many fabulous posts. Thanks for joining us today Amber. I loved your description of your wine relating to the last taste of summer into a dry and mellow autumn. Such a nice description of a wine which leads with earth and not fruit (these are my favorites). Great to read your article Amber. As Jeff, I liked your summer versus late summer description of the wine. 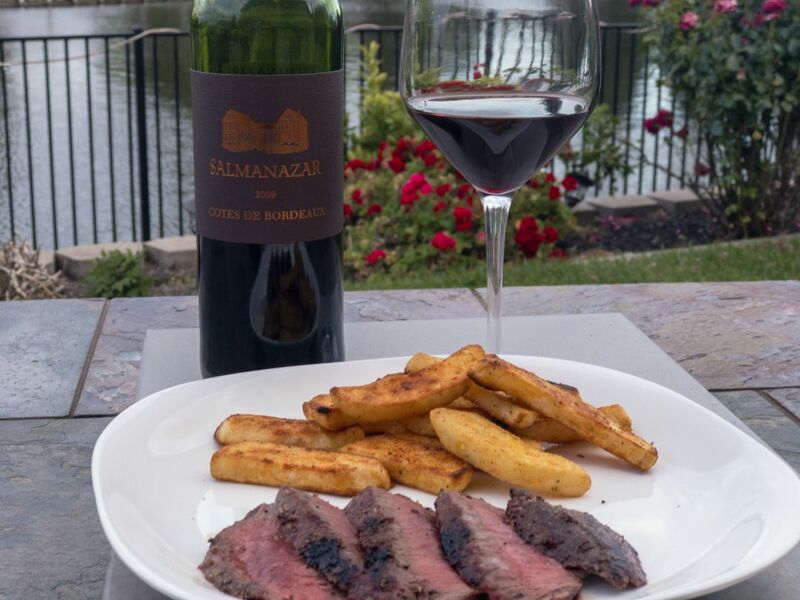 Steak seems to work with Bordeaux. Interesting the cheese was not so great with the wine- Gwen (Wine Predator) had the same experience with a blue cheese. I’m super-hungry after reading your post, Amber! Sounds like the wines were winners, too. As expressed by the other Winophiles, I loved your description of the wines vis a vis the seasons – poetic and so true! I can see this being really wonderful with the hanger steak. I also really liked the comparison to the seasons. Cheers! Lovely wine introduction! A satisfying Côtes de Bordeaux with a cheese plate makes me smile! Glad you joined the Winophiles and thank you for this post! Wow, Jill thank you for your lovely words. I am excited to be a member of such a great group. A wonderful read Amber, especially your comparison of the fruitiness of the wines as it related to peak of season vs end of season! Cheers!